EX trim. Honda Certified, Superb Condition, CARFAX 1-Owner. REDUCED FROM $19,877!, $3,000 below Kelley Blue Book! Sunroof, iPod/MP3 Input, CD Player, Satellite Radio, Alloy Wheels, Back-Up Camera, 4 NEW TIRES. CLICK ME! Was $19,877. 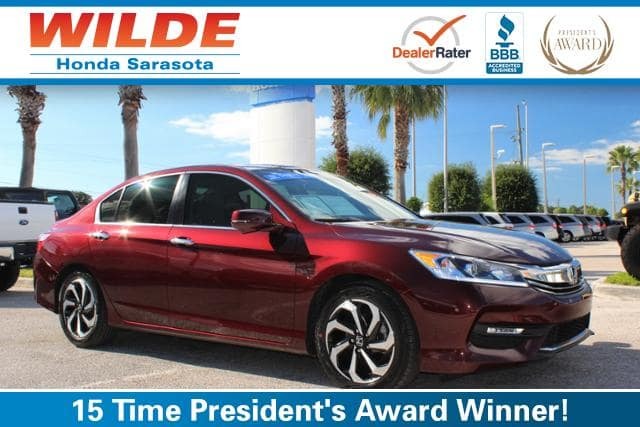 This Accord is priced $3,000 below Kelley Blue Book. Balance of original 7-year/100,000-Mile Powertrain Warranty, Additional 1-year/12,000-mile Non-Powertrain Warranty, Vehicle History Report, NO Deductible, 182-Point Inspection and Reconditioning, 24 Hour Roadside Assistance includes, towing, lock-out assistance, tire change and fuel delivery, SiriusXM free three-month trial period on eligible factory equipped vehicles . Sunroof, Back-Up Camera, Satellite Radio, iPod/MP3 Input, CD Player. MP3 Player, Remote Trunk Release, Keyless Entry, Steering Wheel Controls Honda EX with Basque Red Pearl II exterior and Ivory interior features a 4 Cylinder Engine with 185 HP at 6400 RPM*. 4 NEW TIRES. Pricing analysis performed on 12/7/2017. Horsepower calculations based on trim engine configuration. Please confirm the accuracy of the included equipment by calling us prior to purchase.